Why Iceland and Faroe Islands? A little preface. We are a family of five that loves to travel. We spend our days operating an outfitter and outdoors store in the heart of Pennsylvania’s Allegheny National Forest region, fueling our passion to help folks find that connection with nature. In 2015, we traveled for six weeks around the United States, camping, backpacking, hiking and paddling in ten National Parks. This trip changed our outlook on what’s really important as a family, and we’ve since made it a priority to travel and have these experiences annually. In 2016 we spent six days running around Olympic National Park, and tackled Everglades in 2017. So why did we pick Iceland and the Faroes? First and foremost, we were ready for a trip outside the US. If I’m being totally honest - it was all built around the Faroe Islands. Somewhere around 2006 or 2007 I’d read about these eighteen rocky, volcanic land masses in a National Geographic magazine, and filed them in the back of my mind for the next nine or so years before getting serious about a visit. Through all my research, the Faroes were very safe (an actual prison does not exist on the islands, that’s how much crime there is.) and they aren’t overwhelmed by travelers. Iceland was simply a bonus (a wonderful bonus!) in getting there on a budget. The plan - to drive around Iceland’s Ring Road over eight days. We arrived at Keflavik airport in Iceland at 5:30 am to dark skies, a heavy downpour and wind that had to border 40 mph sustained. We’d rented a car from Nordic Car Rental weeks in advance, and searched for our pick-up van to take us to their facility, with no luck. After looking around for a half hour my son Phoenix (15 years old) had the genius idea to call them. Brilliant! After a quick phone call, they arrived. We headed to the van a short walk away, completely drenched, getting pulled by wind, loaded our two pieces of luggage into the van, and got inside. The looks on my three teenagers exhausted faces was that of, “Mom, what did you get us into on this “vacation”?” Okay, tough start to the journey. But then our driver fired up the van, and what song was playing? “Don’t worry… Be happy. In every life we have some trouble. But when you worry you make it double. Don't worry, be happy. Don't worry, be happy now.” Magic! We all looked at each other - sopping wet, in the dark, van swaying to the side from the high winds - smiles! Yes! A quick rental contract and look around the car for damage, and we were headed on our way. As I was leaving the rental office, the door flung wide open despite my best effort to keep it under control against high winds. I looked at the gal inside and said, “Sorry” with a sideways face. She clapped back, “Be sure to hold your car doors really tight when you open them. The wind can rip them right off.” I gave a nervous look and she assured me - oh no - this is very serious. Hold. Your. Doors. This became something we giggled about throughout our trip every time we stopped. And yes, she is correct, please, hold your doors. Hallgrímskirkja is a Lutheran parish church in Reykjavík, Iceland. At 244 feet high, it is the largest church in Iceland and among the tallest structures in the country. From there we headed toward Reykjavik to pick up a rental cooler we’d reserved from Icelandic Camping Equipment. (With the amount of driving we had planned over the next eight days, we didn’t want food to go to waste.) The idea behind this place is pretty cool. Reserve camping equipment and, with a remote lock station, you are able to pick it up and drop it off any time - day or night. With cooler in hand we headed to find some breakfast. A short walk later we stumbled upon Sandholt, a cute little familiy-owned artisan bakery bursting at the seams with patrons. They nestled the five of us at a table and we devoured a delicious breakfast. Energy! The next few hours were spent in awe of the terrain while driving to our first house in the small town of Vik. We stopped at Skógafoss waterfall along the way. This thing is an absolute monster - 200’ tall and 82’ wide - immediately reminding us how small we really are. Right on cue, a rainbow appeared as we drove up. If you’re a lover of the film ‘The Secret Life of Walter Mitty’, this was one of the films locations. We finally arrived at our first Airbnb house in Vik. A cute little home across the road from Reynisfjara Black Sand Beach, we chose this one because it was the perfect jump-off point to a bunch of cool places, and more importantly, it had a grocery store only a short drive away. Most “towns” in Iceland don’t have anything in regards to grocery stores, restaurants or gas stations. Vik was the perfect spot to get acclimated for a couple days with some convenience. 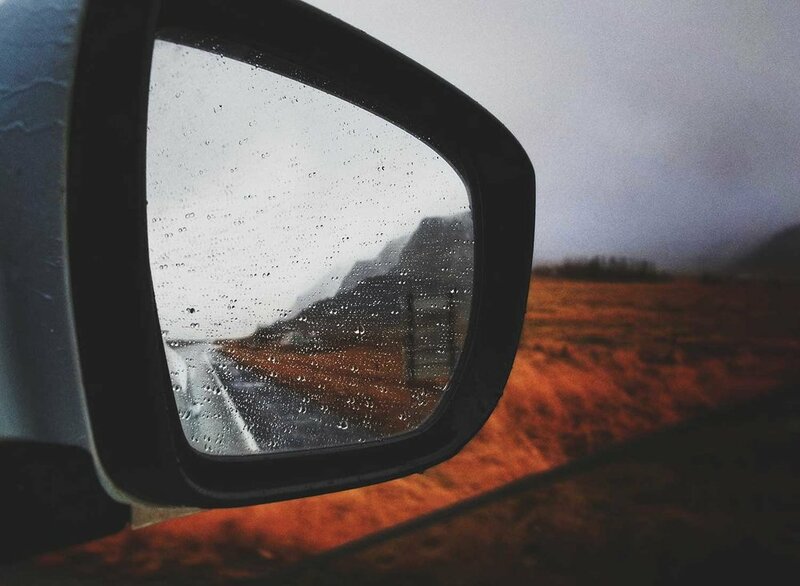 The drive into Vik, Iceland. Road into Reynisfjara Black Sand Beach. Runaway cow getting brought back in. Reynisfjara Black Sand Beach, and our first house in Vik, are just over this hill. A storm moving in on Reynisfjara Black Sand Beach. Dyrhólaey Arch in the distance. Still not adjusted to the time change, I was up bright and early and started exploring around the house and making some new furry friends. We’re so used to being woken up by Great Blue Heron along the Allegheny River at home, but in Iceland, it was sheep! Reyniskirkja Church, built in 1929, from our porch. Our morning friend, black sheep from our greenhouse window. Reynisfjara Black Sand Beach in the distance. This Rock Ptarmigan greeted us when we opened the front door. Such a cool looking bird - look at those furry legs! It has the craziest voice as well! Give a listen below. This sign seems to be working - we found no poop on this trail. We drove 4x4 roads through part of the Sprengisandur highland plateau, which stretches between the glaciers Hofsjokull and Vatnajokull (Europe’s largest glacier). 4x4 roads are the real deal out here. So are one-lane bridges. And sheep. Had our first sheep crossing! We’re unsure exactly what the purpose of this box was, but think it may be a “lost and found” of sorts, containing a random glove, an old snack and a pen. It sits in the middle of nowhere alongside a large road map sign, off a dirt road. We ended the day with a sunset at Dyrhólaey Arch. In the summer, this area has limited access due to birds nesting. The view is breathtaking in all directions, glaciers, black sand beach and North Atlantic Ocean for as far as the eye can see. We caught a glimpse of whales as well! Driver beware, the nearly one-lane, loose gravel road drive down is not for the faint of heart. We got everything packed up and were ready to hit the road north. This little door sat across the dirt road from the teeny tiny place we stayed in, and I'd been meaning to get a picture of it every day but kept forgetting. Finally remembered as we were leaving, and out popped a rainbow. Day three was a lot of driving. The changing terrain made this truly incredible. Our destination was Farm Stay Skorrahestar in the small town of Neskaupstaður, the northeastern most town in Iceland. We stopped a few hours into our drive to stretch our legs and hike out to Skaftafellsjokull glacier tongue, in Skaftafell National Park. Beautiful terrain! We spotted the rare Icelandic Longsquare cloud! 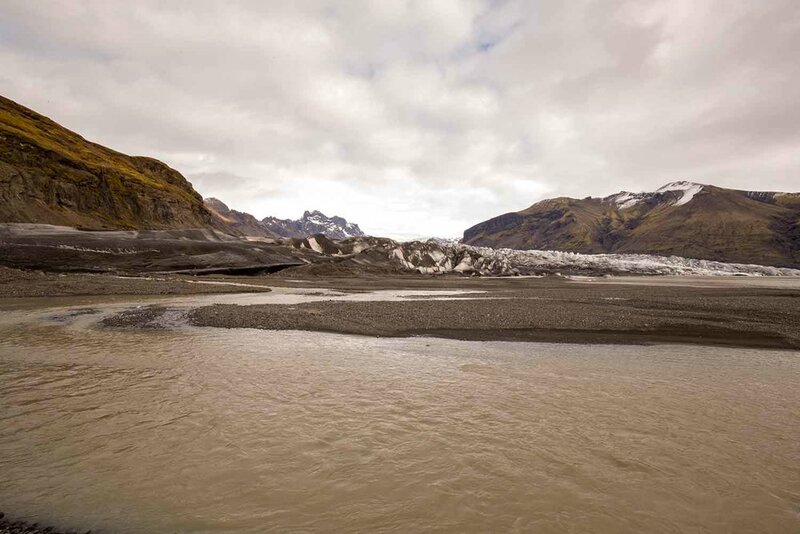 We made a stop at Jökulsarlon Glacier Lagoon - Iceland’s deepest lake at over 800’ deep. Such an interesting place. Jökulsárlón first started forming in 1934, when Breiðamerkurjökull glacier started retreating, leaving the lagoon in its path. The tongue of the lagoon connects with the ocean, combining sea and fresh water, which causes its unique blue color. Jökulsarlon Glacier Lagoon - so cool! We spent the next two days at Skorrahestar, a Farm Stay in Neskaupstadur, a super cute little town of 1,500 on the northeastern most tip of Iceland. I’d been researching places we could stay and ride horses, but wanted an experience. Something off the beaten path. Skorrahestar delivered. 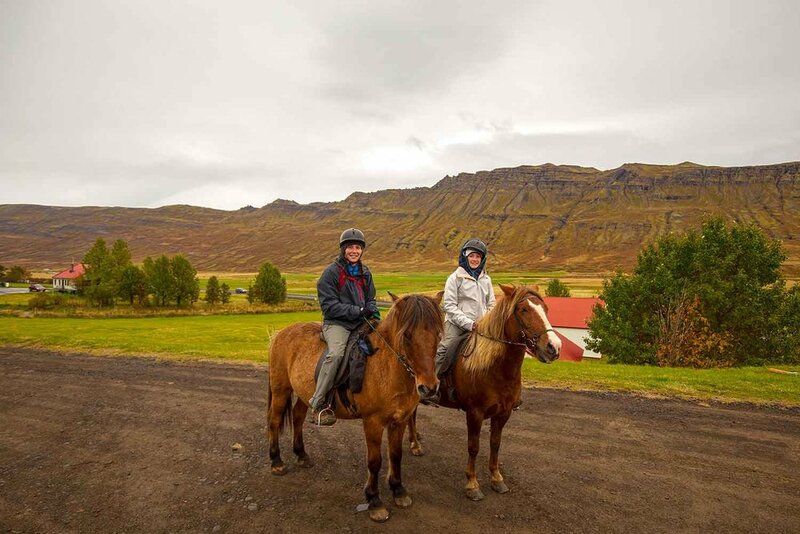 Our hosts, Doddi and Theodora, have been running the farm most of their lives. (It has been in Doddi's family for more than 100 years!) Doddi is a retired science teacher and a hilarious storyteller. Theodora is an incredible artist - painter and sculptor. (And a wonderful cook!) They've renovated an old barn into a beautiful guest house with so many cool touches. We stayed in one of a few bunkrooms, but had the entire place to ourselves due to it being the off season. Skorrahestar has an impressive recycling mission. All waste has its place. Lil and I rode horses with Doddi and Siggi, his right-hand-man. Well, I should rephrase, I got an hour-long lesson on riding horses (we are still giggling that my horse could "smell my fear"), then Lil, Doddi and Siggi went on an adventure through the valley and up the river. Lil helped get all the horses out of the pasture, all suited up and ready to go, and helped put everything away afterward. She was right in her element. Once we watched Lil and her crew disappear into the mountains, we drove to the other end of town where the road ends at a trailhead. There we found the hike out to Páskahellir! Páskahellir is a small cave by the seaside of Neskaupstaður Nature Resverve, with pillow lava and rock tunnels. You can also find holes that were probably formed by prehistoric trees. A forest taht used to grow here was most likely destroyed by lava around 12 million years ago. The cave itself was formed by erosion by the sea and at bottom. 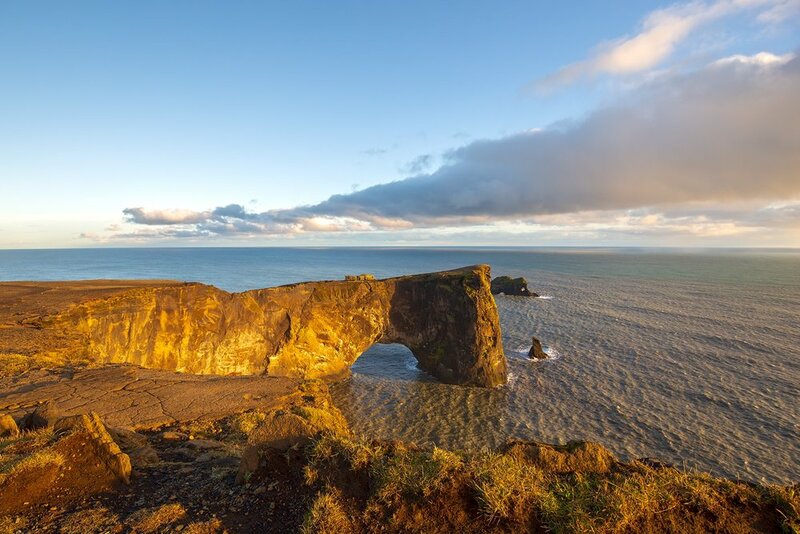 Word has it that you can see the sun dance from Páskahellir on Easter morning. Theodora told us in the summer months there are so many puffin on this trail you can pet them! Unfortunately for us, we arrived too late to catch a glimpse of one. The sound of the rocks tumbling with each wave sounds almost like a deep thunder - you can feel it throughout your body! Neskaupstadur is a super cute little town of 1,500 on the northeastern most tip of Iceland. It’s the most densely populated of the Fjarðabyggð communities. It boasts museums, awesome hiking, grocery stores, restaurants, gas stations, a hospital (which is a really big deal when you get way out here) and it even has a record store! The signs below mark entering and leaving a town. These become really important if you’re on a road trip around Iceland. Towns (gas stations, grocery stores, etc) become few and far between. We all cannot say enough good things about how special our stay at Skorrahestar was! As my oldest son puts it, “We came here as strangers and we’re leaving as family!” So very cool to be able to slow down and visit with locals for a couple days. Learn about the culture, love up on a bunch of pups, kitties and horses, and one sheep that basically runs the place - barking orders at everyone all day long. Thoroughly enjoyed listening to stories of their lives, and only wish we could have stayed longer. New friends! We will definitely be back! We started receiving weather warnings the day we drove to Neskaupstadur. The latest weather forecast issued warnings of winds in excess of 55 mph. 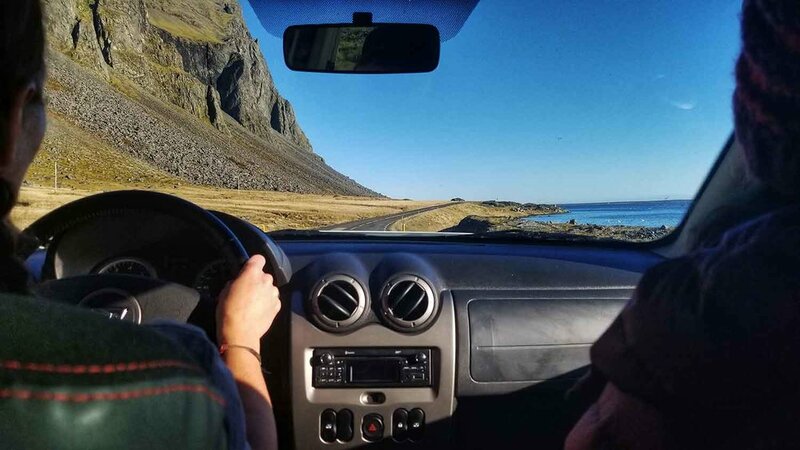 After talking with Doddi and Theodora at breakfast, they recommended we head back toward Reykjavik the way we came to avoid some nasty passes over mountains yet to come. We sure appreciated the advice and tweaked our plans accordingly. We quickly found our next Airbnb and were off on another eight-hour drive to Stokkseyri! No better time to talk shop about driving in Iceland than now. Our experience was very pleasant. No crazy drivers, although it’s definitely a mashup of drivers from all over the world (so you can expect folks to pull off in areas they shouldn’t, halfway on the road next to a cliff with kids running in all directions). Once outside the touristy areas, you’ll come across countless one-lane bridges. Each has a flashing light and sign, and you basically wait your turn if someone is coming. We found a couple that didn’t have a good line of sight, but most were simple. The first time we saw the squiggly sign we thought the road was about to break off into four roundabouts (lol). Thankfully, it’s just a point of interest. The sign on the right was startegically placed just after a 180-degree turn coming down a hill. It explains the upcoming F-Roads. We found it much easier to snap a quick pic of these signs for reference. I’d just mentioned that this was the first time we’d seen this sign and wondered what it was, as we took a speed bump at 45 mph. Speed bump. That’s what this sign is (lol). We stopped for a quick hike to Nykurhylsfoss. We stayed in a small town outside Selfoss. Selfoss has everything you could ever need. The local Kronan grocery store has the best baked bread! Lil and I went out the back door and over the sea wall to explore the coast. We learned that Þjórsárhraun lava field was formed roughly 8,600 years ago due to a huge volcanic eruption in the area around Veiðivötn. Lava flowed down the river path of Þjórsá river in the east and Hvítá and Ölfusá rivers in the west all the way down to the coastline by the two towns of Stokkseyri and Eyrarbakki. It’s one of the largest lava fields that has flowed on earth since the last ice age about 10 thousands years ago. We hit low tide and were able to look at all the shells and found one itty-bitty crabby-pie. Our backyard had a rock wall that separated us from the sea. The only puffin we saw on our entire trip. He was stuck in this frame. If you’re unfamiliar with the Faroe Islands I’d safely say you’re not alone. It was somewhere around 2006 or 2007 when I’d first read about these eighteen rocky, volcanic land masses in a National Geographic magazine. I’d file them in the back of my mind for the next nine or so years before getting serious about a visit. Hindsight being 20/20, I truly believe I was so drawn to the Faroe Islands because they sort of terrified me. So isolated in this odd spot of the North Atlantic where warm waters of the Gulf Stream meet icy waters of the Arctic, hundreds of miles of ocean away from Scotland, Norway or Iceland. Flying into Vagar airport on the Faroe Islands. I’ve been asked what I thought about the Faroe Islands after our short visit. The best way I can sum it up is to say I’ve never been anywhere in the world where, since the moment my foot hit the ground, it’s as though I could feel the pulse of the land protruding from the sea. That did not change over the next five days from island to island. It is truly one of the most emotional places I’ve been lucky enough to explore. We arrived to darkness, a heavy downpour and “hold your doors” wind - again. We’d rented a car with 62 North at Vagar airport. I was a bit concerned because we were arriving “after hours” but it turned out to be the easiest, most helpful car rental ever. The gal behind the counter was patient with all my questions and very kind, giving tips and stressing to drive careful because of the weather. I white-knuckled through high winds and all sorts of precipitation from Vagar to our first Airbnb in Hvalvik, roughly thirty minutes away. 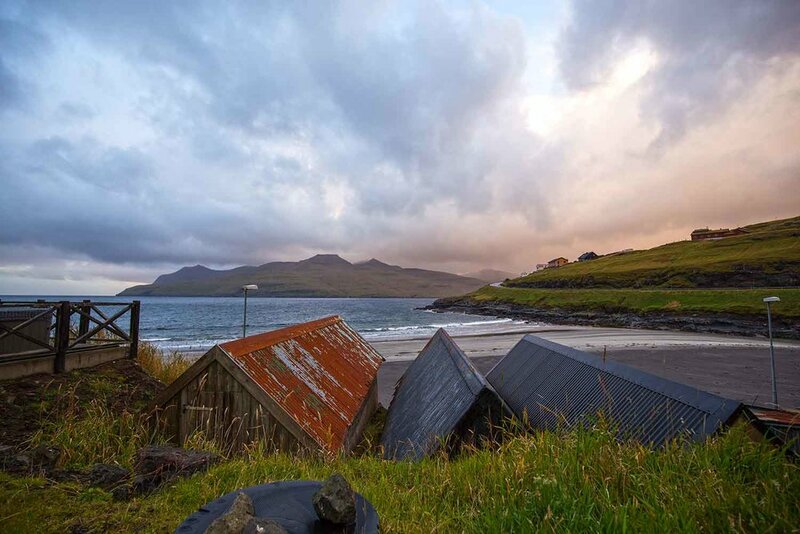 Our hosts met us there, which we were so thankful for after realizing it was tucked away on a small side street found only by traveling through a little port separating Streymoy and Eysturoy islands. Our hosts were so helpful, letting us know where the closest grocery stores were and when they closed. And they told us about Joe’s Pizza, the little yellow building in the picture below. It was within walking distance of our house and it’s open until 2am - a total luxury in the Faroe Islands. (We fell in love with Joe’s - awesome pizza, shawarma and burgers, and salt and vinegar fries like no other.) 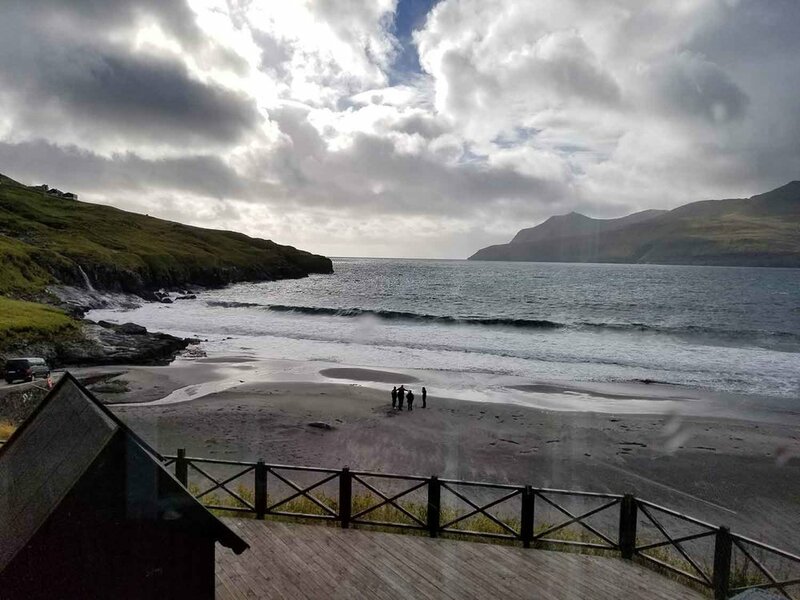 Between our hosts, the gal at the car rental, and Joe and his wife, we’d hit the “kind human” jackpot in the Faroe Islands! Semi trucks are very slender and have what seems like 500 lights on them at night! Joe's Pizza within walking distance! We had our choice of a couple grocery stores a short five minute drive in Hvalvik - Bonus and Á handil. From what we were told, Bonus is a bit cheaper, but Á handil had better produce, so we stocked up there. Up at sunrise - ready to explore! We let the kids sleep in for a bit while we took a drive to finally catch a glimpse of our surroundings! Sunrise from our porch in Hvalvik. The first little neighborhood we came to, this pup came out in the middle of the road to greet us. We were so happy to see a dog! Haldórsvík, population 150, located on the northeast side of Streymoy island. This stone church was built in 1856 and is the only octagon church in all the Faroes. 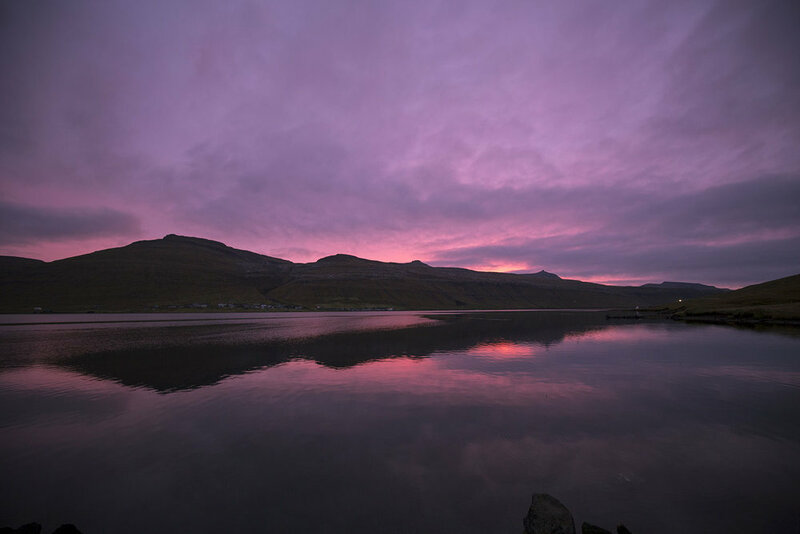 The light comes and goes in the Faroes so quickly. Driving out toward Tjørnuvík, we rounded a bend to find a giant excavator starting work on a tunnel. Just one guy out there, building a tunnel. Our first Faroe sheep encounter. 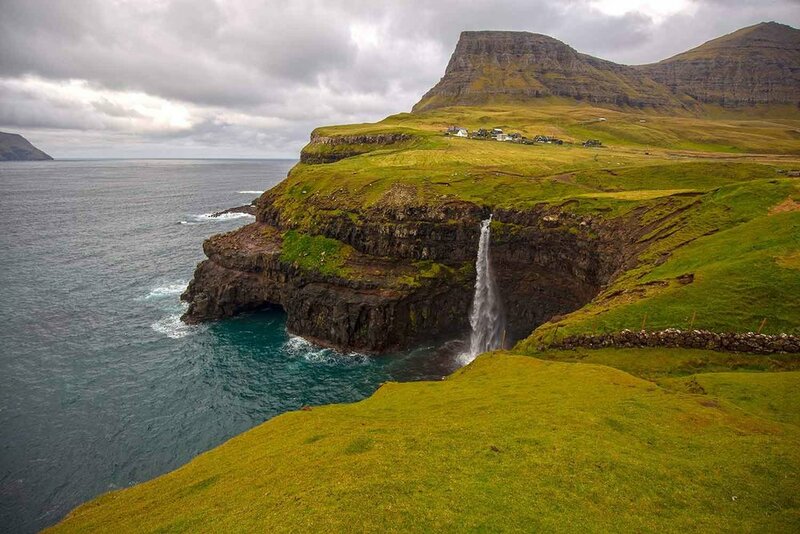 Tjørnuvík, the most northerly village on the island of Streymoy, is one of the oldest towns in the Faroe Islands. Viking graves have been found in the eastern part of the valley. Tjørnuvík has wonderful heated restrooms as you enter town. We’d hoped to get a cup of coffee at a small shop in Tjørnuvík but it didn’t open until 2pm. Risin and Kellingin in the distance, as seen from the beach in Tjørnuvík. Risin and Kellingin are the two sea stacks just off the northern coast of the island of Eysturoy in the Faroe Islands close to the town of Eiði. The name Risin and Kellingin means The Giant and the Witch and relates to an old legend about their origins. The Giant (Risin) is the 233’ stack further from the coast, and the witch (Kellingin) is the 223’ pointed stack nearer land, standing with her legs apart. They reached the north-westernmost mountain Eiðiskollur, and the giant stayed in the sea while the witch climbed up the mountain with a heavy rope to tie the islands together so that she could push them onto the giant's back. However, when she attached the rope to the mountain and pulled, the northern part of the mountain split. Further attempts were also unsuccessful, and they struggled through the night, but the base of the mountain was firm and they could not move it. Standing on Streymoy Island, with Eysturoy Island to the left, separated by the sound of Sundini, North Atlantic Ocean. Oh boy. I’m running out of adjectives and we’re only a couple hours into our first day. Weather in the Faroe Islands is similar to Iceland in that it changes every five minutes, but the isolation seems to magnify each round of fog, rain, hail and snow. You could feel how battered and weathered the structures were, exposed by the waters edge, grass beaten down by wind. We got back, all piled in the car and headed to Klaksvík, the second largest town in the Faroes on the island of Borðoy. 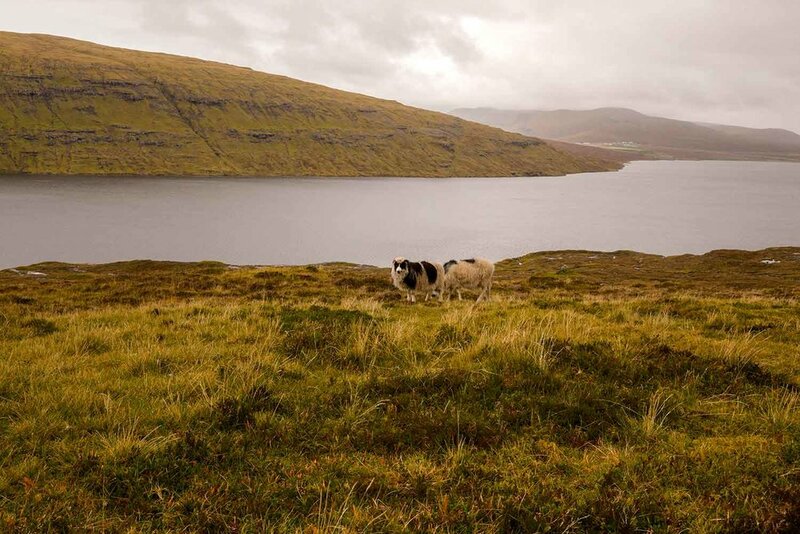 We know first hand the impact visitors can have if they shop off the beaten path, and we’d been saving our shopping dollars for the Faroes. We found a small shop that sells beautiful yarn and found a couple super comfy sweaters and hats. The gal at the clothing store recommended Fríða Kaffihús, a cafe down the road for lunch. This little place had such a wonderful atmosphere. So calm and soothing with folks coming in and out. The two gals working were patient and playful helping us figure out the menu, the food was seriously delicious and the ginger ale was perfectly extra-ginger-y. Fríða Kaffihús balcony can be seen on the right side overlooking the small inlet. We spent the next couple hours wandering around in awe of our surroundings. We hiked paths from pull-offs on the roadside, fighting the wind and rain. We eventually made our way to Fossá, Faroe Islands tallest waterfall. It has a series of drops that total almost 500' from its top tier to its last into the North Atlantic! The trailhead sign includes a map, but the established trail was hard to find. The combination of signs asking you not to walk on the grass (it’s imposrtant!) and the sheep, we decided to rock hop up to the big falls. We found Phoenix's boat at the port near our home! One of the oldest churches on the Faroe Islands. Evening glow in our little neighborhood. 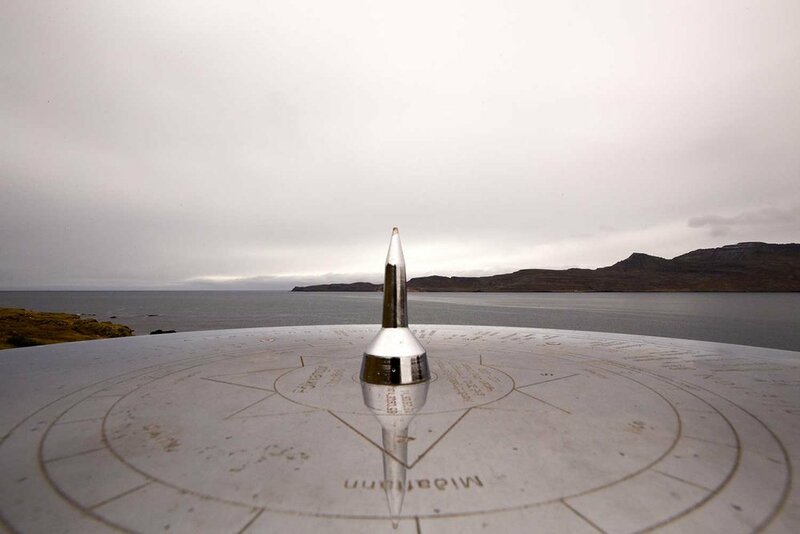 Clear skies and calm wind in the night sky over the Faroes! For the first time since we left Pittsburgh ten days earlier, we woke up to calm weather. I cannot express how much we enjoyed being in fresh, calm air while watching the sun rise over a couple cups of coffee. I’m totally convinced we should all strive to do that more often. Looking at Eysturoy Island from Streymoy. Of course that weather didn’t last long, but that was okay, we were grateful for the sunrise. And the rainbow just before we left helped as well. We loaded everything up and headed toward our next house in Leynar. We dropped our bags at the house and took a look around the kitchen to plan dinner. Hopped right back in the car and found our way to the trailhead to hike Trælanípa at Sørvágsvatn, the Faroe Islands largest lake. As soon as we got out of the car it started to pour. We all jumped back in and sure enough, it was just a light drizzle three or four minutes later. Once we got up over the first hill the wind started in. 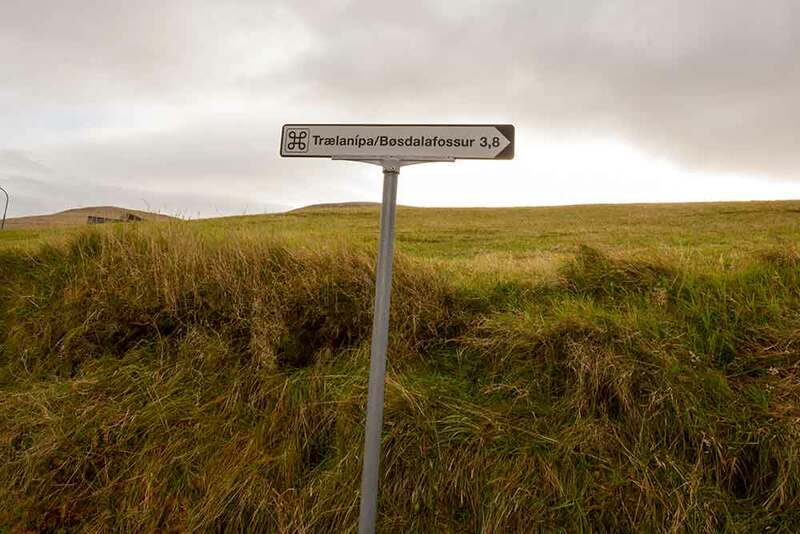 The further we hiked toward Trælanípa, the more intense the wind became. Lily immediately made new furry friends as she exited the car. Gate, map, donation box and garbage can! 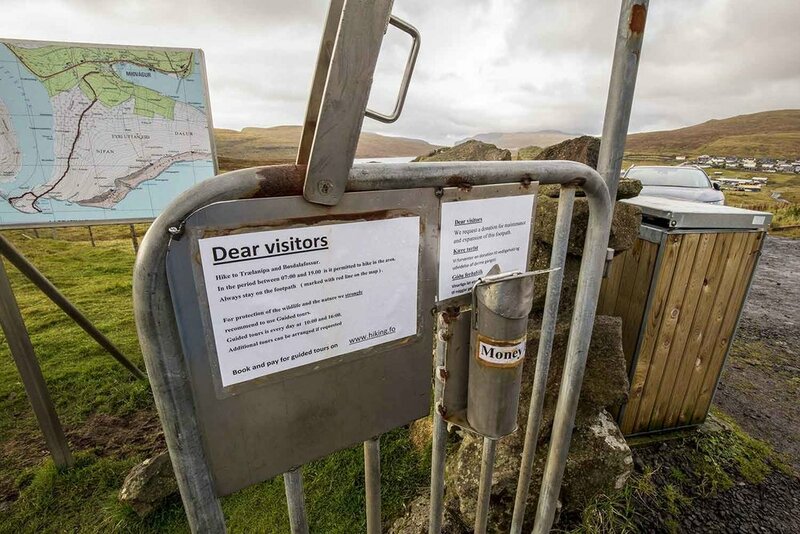 It’s so nice to see so many opportunities for folks to throw away their trash strategically placed in the Faroes! Argh… wish I knew this beforehand. Note to self for next time. I’m still not sure how to put this place into words. I’m sure there are beautiful blue sky days where one can relax, watch migratory birds and sit on ledges for a good picture, but the feeling when winds are near 40 mph with gusts to who knows what, it is intense. Almost downright eerie at times. These white bags were full of what appeared to be crushed lava rock. Maybe a future trail maintenance opportunity for our next visit? This is not my photo - included for size reference of these cliffs (and I could not find an actual photographer to credit). They are massive. The cliffs are stunning. But they hold a very dark history. Trælanípa juts 142 meters upwards out of the sea. It’s also known as the “Slave Cliff” - getting its name from the Viking Age when slaves were pushed off the mountain. This picture speaks. Sue, in the distance, is not posing, she’s simply trying to walk against the wind. LORD. It was at this point we needed a little silliness. The history lesson of Trælanípa was heavy, and the weather was not helping to ease the intensity, so we did what we do and had a bench-warming party and banzai jumping contest on the hike back. Once back at the trailhead we learned about another creepy tale… the Nykur. It lives in Lake Sørvágsvatn. The legendary Nykur (also known as the “Nix” in English) uses its beauty to lure passersby to pet and mount it, and once an unsuspecting man, woman, or child does so, the beast’s “sticky skin” traps them in a terrifying barrel roll as it drags them down to the bottom of the lake to drown. This legend is mostly invoked by parents of small children, to scare them away from the edge of dangerous bodies of water. The Nykur’s one weakness is that if someone calls its name aloud, the creature will lose all of its power and retreat to the depths from which it came. 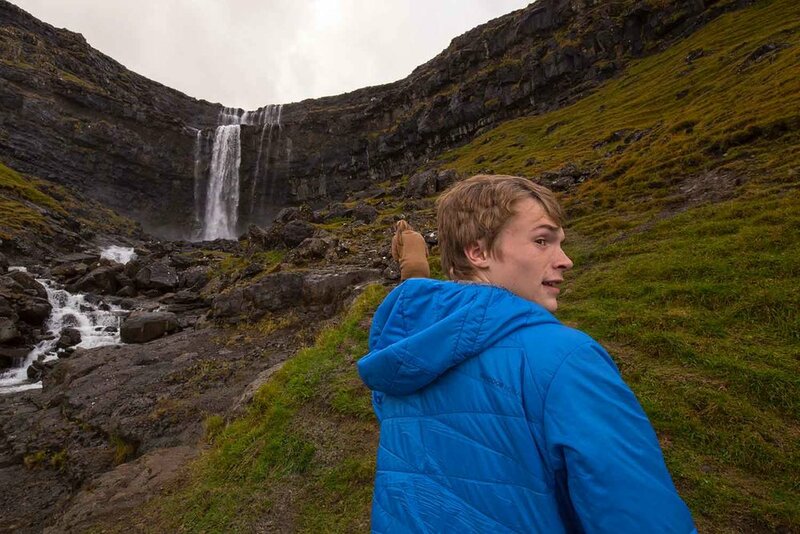 And the Faroese legends say that once, a small child happened to see a Nykur roaming through the shallow water of Lake Sørvágsvatn while he was out playing. In awe of the creature’s beauty, the child approached the Nykur. The child wanted his brother, Niklas, to see the pretty horse as well, so he called out to him. Since the child was still small and unable to speak properly, he accidentally shouted the word “Nykur” instead of “Niklas.” Thus having spoken the creature’s name, it lost all its power and returned to the deep cold waters of lake Sørvágsvatn to try its luck another day. On the island of Vágar in the Faroe Islands, a silver statue of the mythical Nykur rises from the northern tip of Lake Sørvágsvatn. 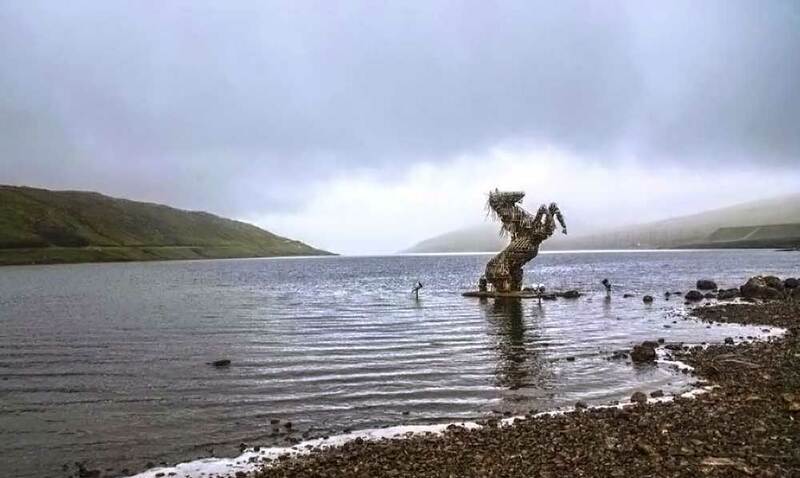 The statue was created by local artist Pól Skarðenni, and appeared in the waters of the lake in 2017. A plaque tells the legend of this sinister beast. On our way back to our house, we found the closest grocery store, which was more along the lines of a large gas station. Much less selection, but we made do. 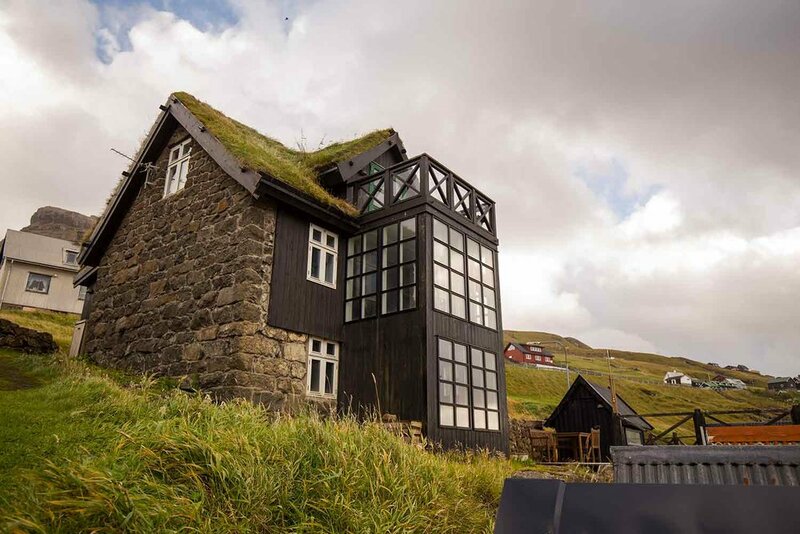 Our final home in the Faroes. I suppose now is the time to talk about some long-standing traditions in the Faroes that were extremely uncomfortable for us. Walking into our last home in the Faroes, you couldn’t miss the giant painting of “Grindadrap” - the whale hunt - hanging above the couch. If you’ve done any research on the Faroes, you most likely know what this is. The images are hard to un-see once you've looked at them; blood-red oceans, men covered in red holding knives in their hands. We want to make it clear here, as a family with a commitment to ethical and sustainable travel - we do not agree with this annual Faroe Islands whale hunt. But having traveled through the islands and reading up on it ourselves, we kind of understand where both sides are coming from. 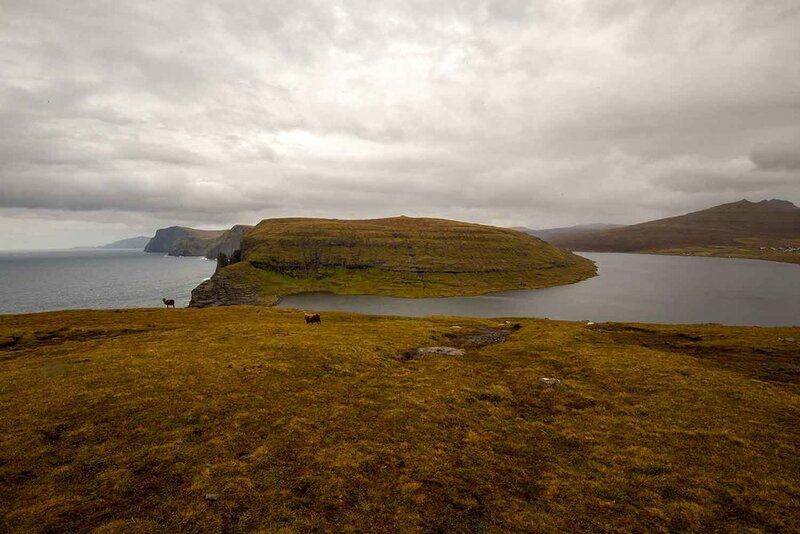 See, when it comes to crops and agriculture, the Faroes are wild and desolate. Only 2% of their land is actually arable, and when it is, only root veggies like potatoes, turnips, and rhubarb grow. (Their potatoes are so tiny!) For centuries, the Faroese survived on whale meat and other gifts brought to them by the seas; fish, shellfish, and seabirds. There were sheep, but not enough to consistently feed entire populations and be sustainable and provide wool. The whale hunt was born from sheer necessity, it became integral to the way of life and identity of the Faroese and their survival, and for many, it's seen as the most sustainable way to source meat by saving millions of Kroner and energy consumption in transporting beef from across the world instead. Thankfully, we didn't witness any of the whale hunt ourselves, but we thought we might. Through my research I’d read there were 23 approved beaches where they could take place, but I was unable to locate an actual map of those beaches. At one point, a van pulled down our road to the beach. A group of men got out and spent 20 minutes on the beach, the older gentleman using a stick to draw in the sand, while pointing to each man, then to the sea. Admittedly, I was a bit mortified that I may have just gotten us front row seats to something we did not want to witness. As we explored the beach later that day, we couldn’t help but wonder what was in all the tiny sheds along the waters edge. I will add, this made for some great conversation with our teenagers. At the end of the day, trying to understand someone else's way of life - even if you don't agree with it - is such an important part of travel, and we really encourage you to try and do the same on your own travels there. It would be a major disservice if I didn't mention the driving experience in the Faroes. Overall, it’s very pleasant. We didn’t come across any hostility or real traffic. (Note: when someone is going to pass you in the Faroes, they will flash their high beams real quick before doing so.) That’s not to say it wasn’t unique. We drove on one-lane mountaintop roads as high as 2,800' and as low as 500' under the North Atlantic. And holy sheep. There are A LOT of ‘em. And they have no fear. You’re on a cliff driving and one pops up from the couple-thousand-foot drop to poke around, shooting you an annoyed glare. If you haven’t stumbled upon the Faroe Islands struggle to get google to map their islands - the video is below. It’s adorable! And genius! There's also an impressive system of tunnels on the Faroes for such a small area. Two go under the sea and the remainder go through mountains. Twenty tunnels in all, nine of which are big, beautiful, normal tunnels with two lanes, great lighting, solid walls, emergency pull-offs with phones, etc. The remaining eleven are one-lane, on various islands. 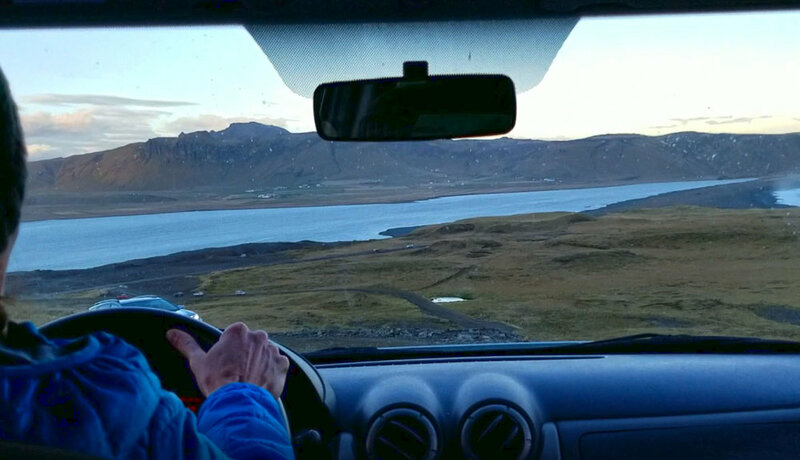 I’d done some research and stumbled upon this great little video on driving in the Faroes. Being that we were doing a bunch of hiking, it was at this point we finally had to tackle a one-laner. I know it looks like any normal tunnel from the outside, but what you cannot see in these pics (because I was not allowed to stop for a picture by my fellow passengers lol) is the piles of rocks on the road in this nearly mile-long tunnel. It's just carved out, with earth falling down in spots along the way, and an occasional light bulb dangling. What an experience! On the other side of that tunnel, we made it to Múlafossur waterfall in the tiny town of Gásadalur, population 20. We arrived to border collie and shepherd rounding up sheep near the parking area as a couple of them attempted to run, sending the whole of them in all directions. I'll admit, I'm growing rather attached to these furry creatures that dot the mountainsides. Lil talked shop with a couple Faroese horses along the way to Múlafossur... they are just as beautiful and dramatic looking as the terrain which they call home. This Faroese horse was so BEAUTIFUL. Short hike out to Múlafossur waterfall. 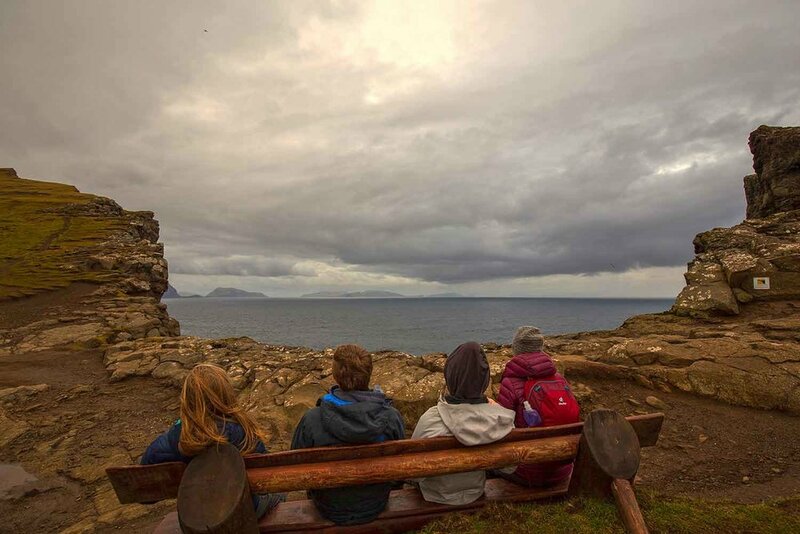 One thing that can make your trip to the Faroes extremely hard right from the get-go is the weather. The only predictable part of the weather here is that it is totally unpredictable. 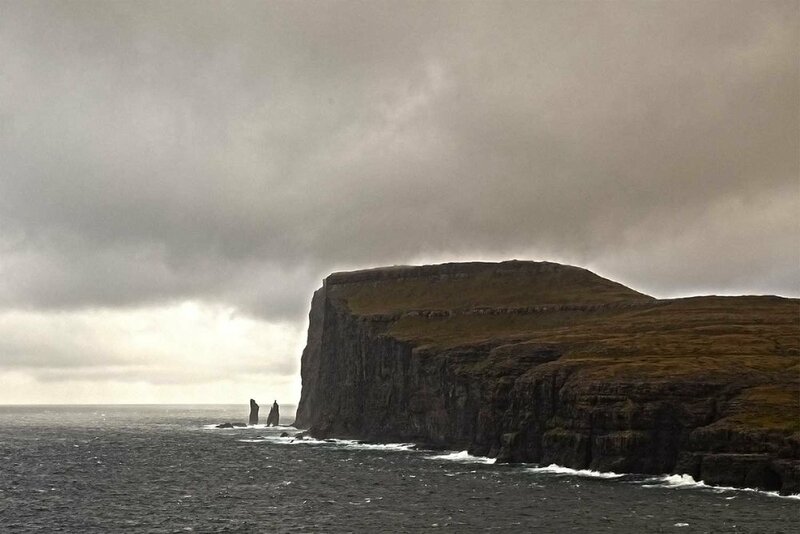 Winds were sustained at nearly 50 mph our last night in the Faroes. Our whole house would shake throughout the night every few minutes when a gust would blow in. Today's weather consisted of wind, periodic rain, windy wind, occasional hail, strong wind, a touch of light snow, and super duper blow you away forever wind. I'm takin' a lot of heat over here about how we never go to the beach on vacation. So... Lil and I walked down to the beach... on vacation. Love her face! And silliness! Enjoy! An early flight gave us a glimpse of the Nyker lit up on the way to the airport. “Kiss & fly” - best airport sign ever! 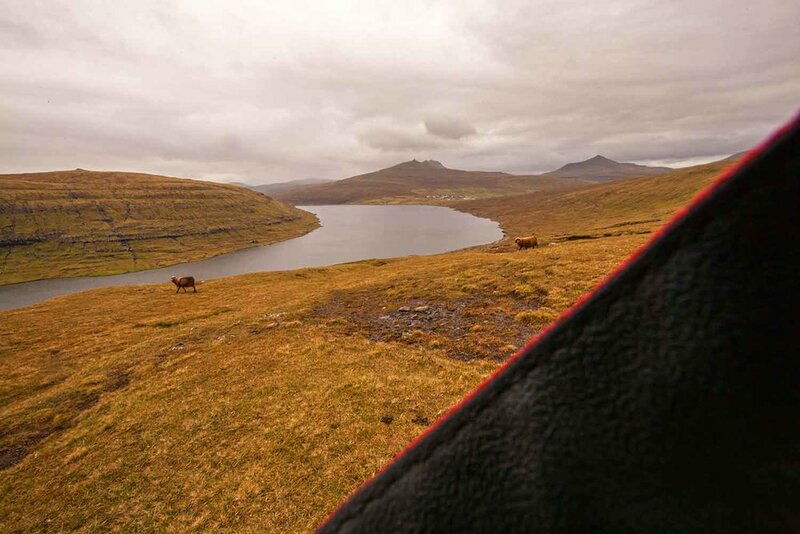 I will be back for you, Faroes. Back to Iceland we go! I would not recommend the car rental company we used in Iceland. I’ll glass-half-full the experience by saying we got to catch a four hour nap before leaving Reykjavik. Our final home was in the small community of Úthlíd, about an hour and a half from Reykjavik, and right off the Golden Circle. With three days left, our plan was to do a bit of hiking and a lot of relaxing. Our home was an incredibly quirky, well-built structure with two pyramids and endless geothermal hot water. At this point in our trip, we’d been unsuccessful in spotting a puffin, but really hoped to catch the northern lights. 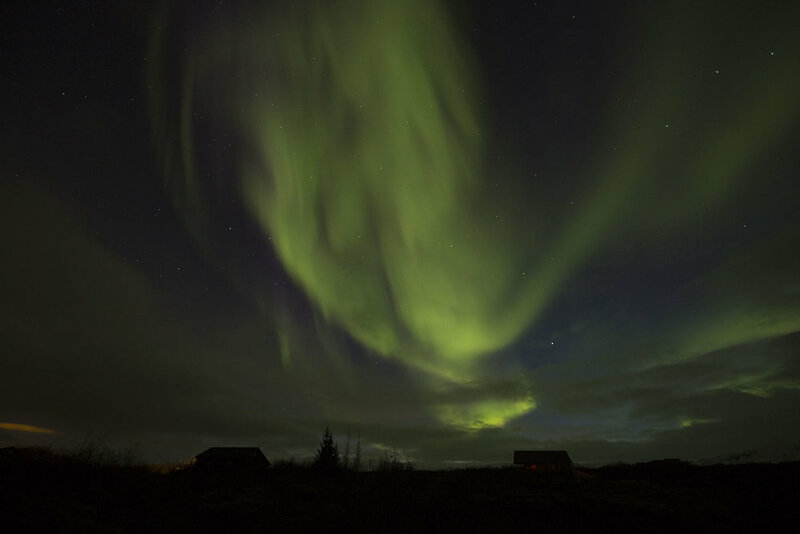 Our Airbnb host gave us a great link to check on the likelihood of seeing the northern lights in Iceland. I became obsessed! Caught a beautiful sunrise from our porch. Being so close, we decided to check out Geysir. Although a bit touristy for our liking, we enjoyed a nice little hike and it was a great learning experience. The geothermal field in Haukadalur lies on the outskirts of the neovolcanic zone from which it is drifting, and is therefore gradually becoming a low-temperature field. Magma may have forced its way out of the neovolcanic zone along one or more fissures, forming intrusions. This would explain the sustained geothermal activity. There is no evidence of recent (holocene) volcanism in this area and the bedrock appears to have been formed subglacially towards the end of the glacial period. The area became active more than 1000 years ago and comprises more than a dozen hot water blow holes. Geysir is large, but years can go by between eruptions here; it is currently in an inactive phase. When it does erupt, the water can shoot up in the air as high as 230 feet. The most active geyser in the area is Strokkur. It sprouts hot water as high as 30 meters into the air every few minutes! We spent a much needed day relaxing at the house, running back and forth from the geothermal hot tub. I started keeping an eye on the northern lights probability for our final night. I’d seen them in Alaska numerous times before, but my kids were too little to remember, and Sue had never seen them. Sue kept telling me not to worry, that her mom Joyce, who we lost four years ago, would take care of it and we’d see ‘em. A beautiful mountain sunset on our last evening. Sure enough, just before dinner I took a peek outside, and there they were! All I could do was yell, “Northern Lights! !” Everyone scrambled, tripping over chairs, running outside. We watched a stunning display of northern lights dancing around the stars for the next hour. In the shape of a “J” no less. Thanks, Joyce! All packed up and heading back to Reykjavik. We learned about the Mid-Atlantic Ridge. If you’re unfamiliar, it’s a submarine ridge located along the floor of the Atlantic Ocean, that wraps around the globe for more than 65,000 km like the seam of a baseball. It is the longest and the most extensive chain of mountains on earth, but being located underwater, more than 90% of this mountain range remains hidden from view. There are only a few places on earth where it juts out of the surface of the ocean, in the form of a few islands, one of which is Iceland. Iceland represents the largest portion of the mid-Atlantic ridge exposed above sea level. Formed from volcanic eruptions on the Mid-Atlantic ridge, about 24 million years ago, it is one of the few places where you can stand on the ridge on dry land. The section of the ridge that includes the island of Iceland is known as the Reykjanes Ridge. The ridge is spreading at an average rate of about 2.5 cm per year. 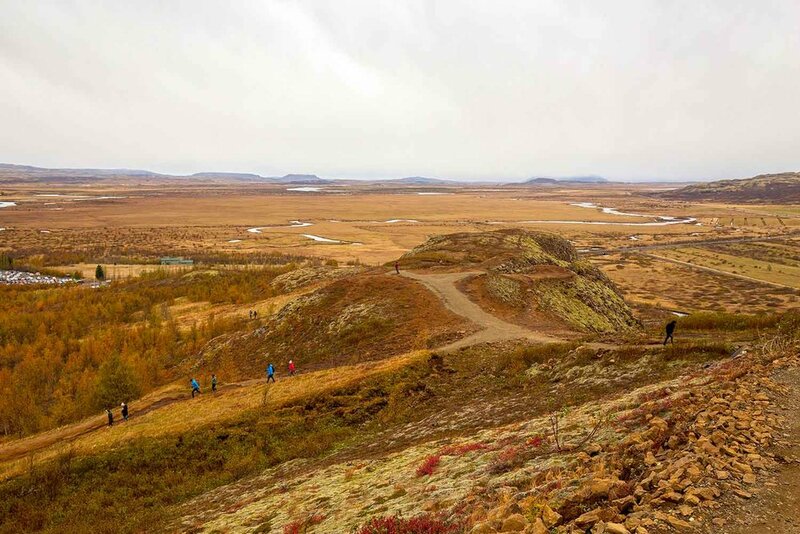 Over the past 10,000 years the Thingvellir Rift Valley has widened by 230 feet (70 m) and sunk by 131 feet (40 m). Not only is the mid-ocean ridge changing the geography of Iceland, it’s also responsible for the volcanic activity which created the island. 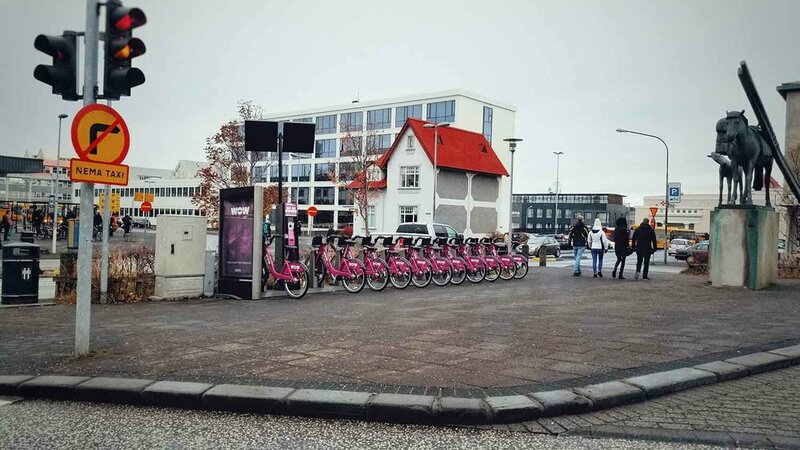 We found this bike rental in Reykjavik near the airport. We’ll take advantage of this next time! Love the recycling system at the airport! The automation at Keflavík International Airport made for quick traveling! An entire wall in the airport. See you next time, Iceland! Rent a car. We rented a 4x4 because we wanted to potentially explore F-Roads (where 4x4 is required) and we were traveling north in late September. Renting a manual (vs automatic) will nearly cut your rental price in half. We did not get GPS with our vehicle, but did get wifi. A diesel car is going to save on fuel as well. Bring some things with you. Not knowing what we were in store for, we brought coffee, sugar a bunch of snacks, and big bottles of shampoo, conditioner and soap in our checked bags. The coffee, shampoo, conditioner and soap lasted our entire trip. Where to stay. Traveling in late September as a family of five made the weather too unpredictable to consider camping. Hotels are very expensive for a crew of five (between $500-600 per night). 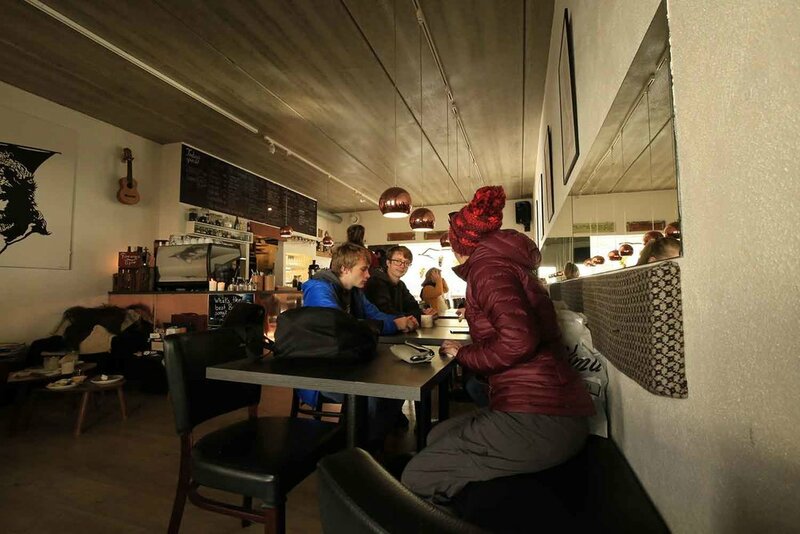 There are a number of hostels scattered around Iceland, but as a family we found Airbnb’s to be the least expensive option, almost a third of the cost of staying in a hotel at times. If you can find an Airbnb with a washer and dryer (or just washer and a hanging rack) - you’re ahead of the game, especially with a family of five. Bring a water bottle! The water in Iceland is the best I’ve ever tasted. Sue despises water and she Could. Not. Get. Enough. Pack for the weather. These costs are totally avoidable. Each season is different. Talk to your cell provider about an international phone plan. Be clear about what countries you’re visiting. They’ll send you a reference email packed full of useful info about talking and texting while traveling internationally. Our verizon plan cost around $40 and gave us so much peace of mind. Don’t do the expensive touristy stuff. This one speaks for itself. There are so many places to explore that are free! Don’t forget a power converter! WOW + Atlantic Airways. If you’re coming from the US, this combo is the least expensive way we found to get to the Faroes, with a layover (or adventure!) in Iceland. Play with different dates - it’ll pay off. Rent a car. We rented a 4x4 because we were exploring in early October. Renting a manual (vs automatic) will nearly cut your rental price in half. We did not get GPS with our vehicle, but did get wifi. A diesel car saves on fuel as well. Faroe Islands have right-hand traffic (same as in the US and most of Europe, except the UK), and you are required by law to have your lights on at all times. Unlimited tunnels. If you decide to rent a car, be sure to know where you plan to travel. 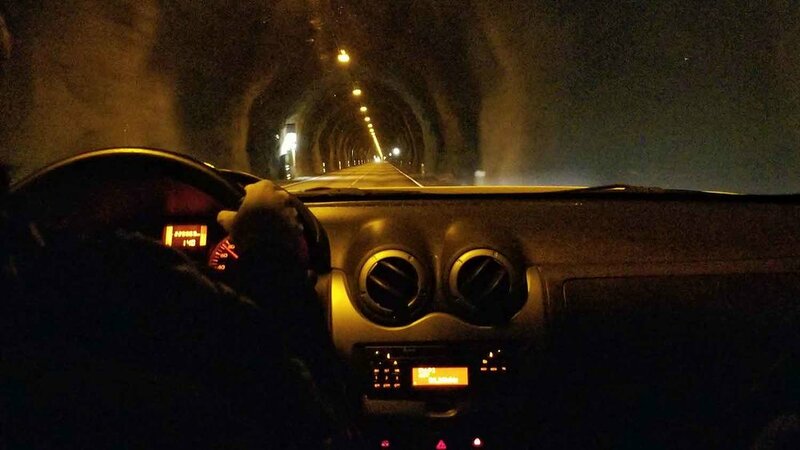 We got unlimited tunnels with our rental car ($45 for five days). Sub-sea tunnels cost $15 each time you go through them (and back) and you have to pay at designated stations. Not only did we save with the unlimited addition, but we didn’t have to waste time finding a station. Consider traveling via helicopter. Nope, we’re not kidding. There are a number of ferries that connect the outer islands, but helicopter is often cheaper. Atlantic Airways offers super cheap ($20-$30) helicopter rides between islands four days a week, most of the year, weather dependent. You can find the timetable here, costs here and book a trip here. Rent a bike. 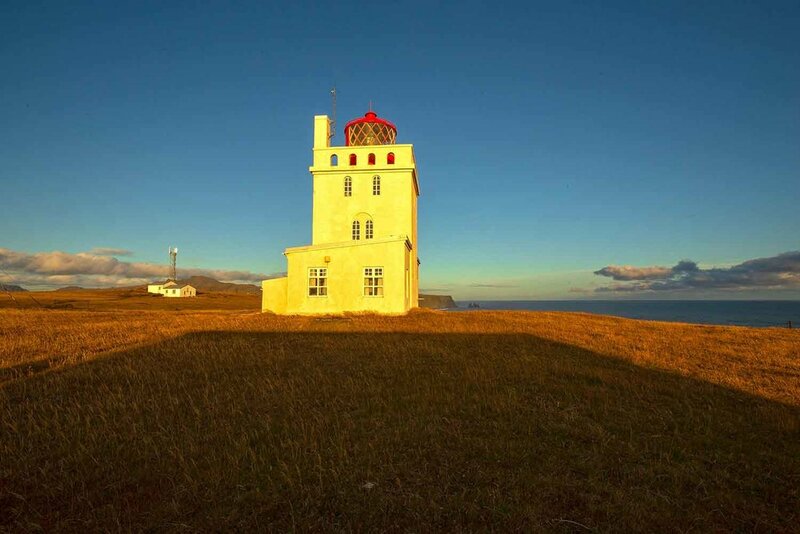 If you’re planning to explore Torshavn (we didn’t on our short trip), consider doing so via bike! Bus and Ferry schedule. As a family of five trying to cover a lot of ground in a short amount of time, using public transportation was not feasible. 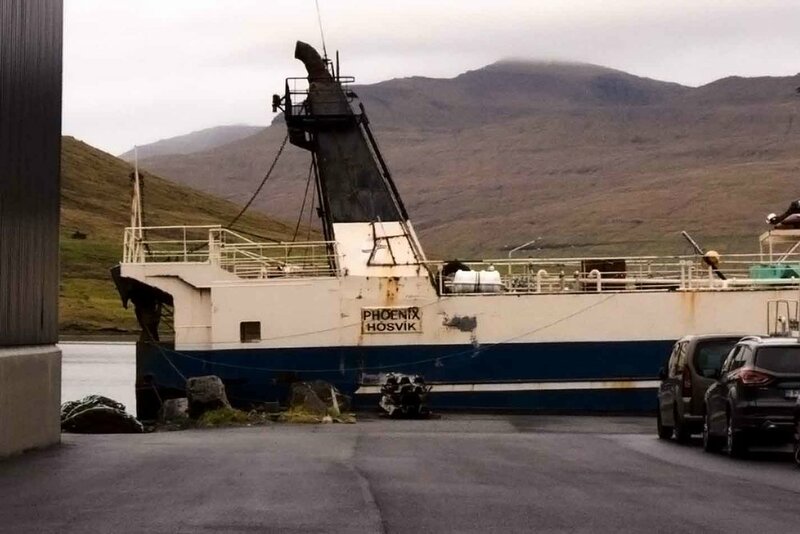 But the Faroes have incredible infrastructure to get around via bus if it works for your trip! Hike safely. 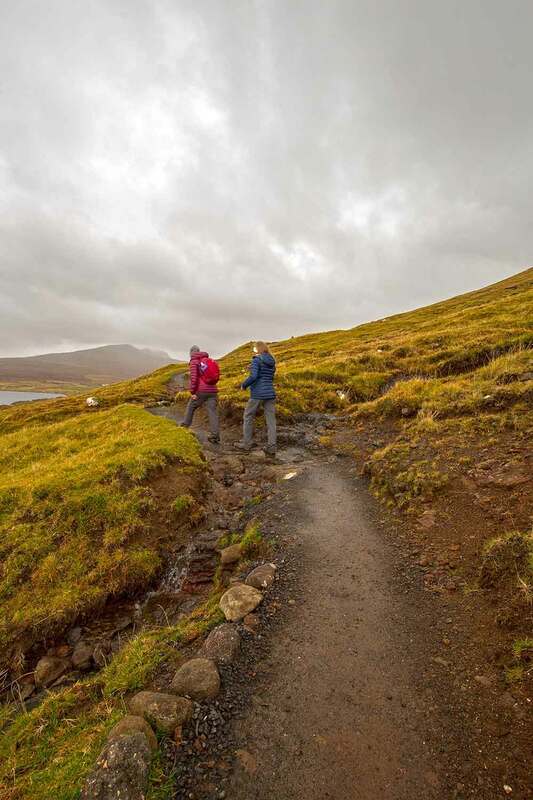 There are some great tips in the Faroe Islands Guide to Safe Hiking. Pack for the weather. 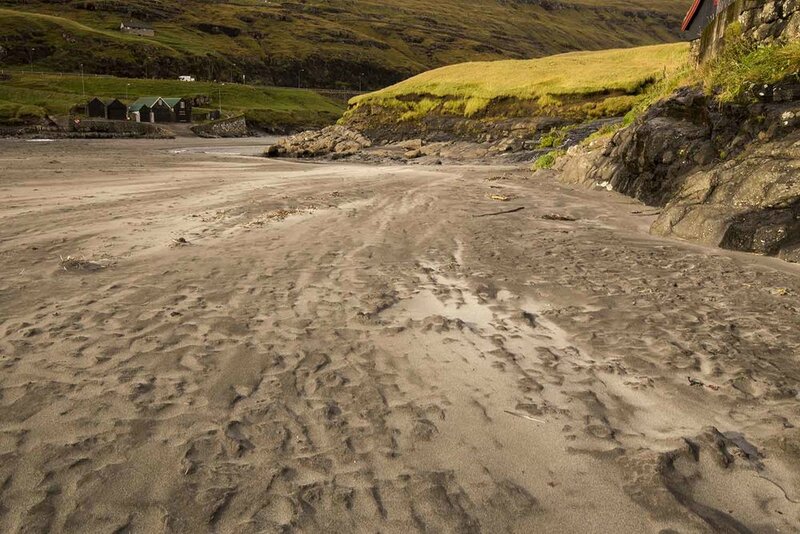 The only predictable part of Faroe weather is that it is completely and totally unpredictable. These costs are totally avoidable. Investing in good quality gear is going to save so much monetarily and give you the comfort to handle the elements. You don’t need cash. We were able to use our regular bank debit card for everything in Faroe Islands. Be sure to let your bank know about your upcoming trip to avoid lengthy foreign phone calls while traveling. Talk to your cell provider about an international phone plan. Be clear about what countries you’re visiting. They’ll send you a reference email packed full of useful info about talking and texting while traveling internationally. Our verizon plan cost around $40 and gave us so much peace of mind. The Faroes are different than Iceland in respect to charges. Be sure you’re very specific with your provider if you think you’ll need to call internationally. Luggage. As a family of five we had two checked bags - one hard suitcase and one Seal Line dry bag. WOW Airlines and Atlantic Airways allows checked baggage to weigh up to 44 lbs (20 kg), so we tried our best to distribute the weight properly. Our first flight from Pittsburgh to Iceland one bag weighed 23 kg and the other 13 kg, so we made adjustments during each flight until we finally had both bags under. (I will note: WOW did not charge us extra for the overweight bag. Yahoo!) The combined dimensions of each checked bag must not exceed 62 in (158 cm). Our hard suitcase was 61.5 in. 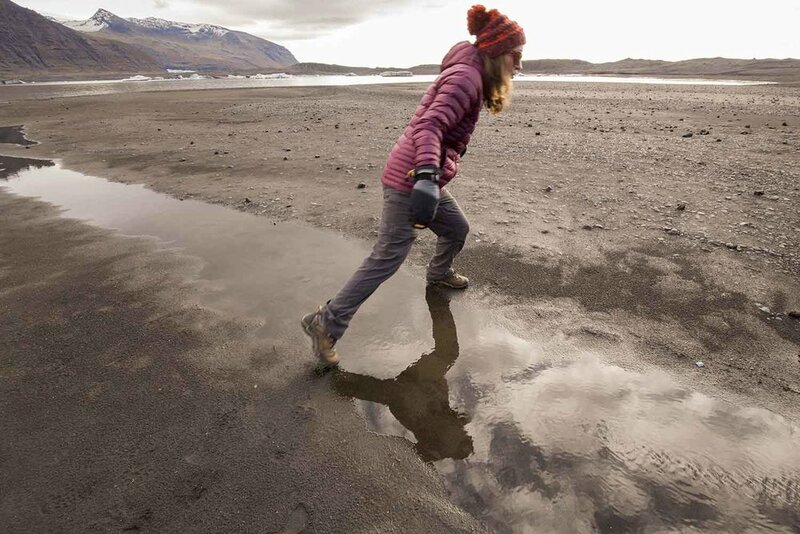 Clothing for hiking: Good sturdy waterproof hiking shoes. Base layer shirt (long sleeve, sweat-wicking) and tights. For our hiking pants we went with OR Cirque pants due to their water, wind and abrasion resistance (plus they basically have built-in gaiters!) - highly recommend them for men and women. Fleece or wool sweater (we purchased a couple wool sweaters in the Faroe Islands). Warm gloves, scarf and hat. Three pair wool socks each. Winter coat with rain shell. Lounge wear: After a long day of battling the elements, comfy clothing to lounge in is one of the best feelings on earth. We each took two t-shirts, favorite hoodie and a pair of comfy leggings or sweatpants. Four pair of underwear each. Hair brush, deodorant, lotion, chap stick, sunglasses, tooth brush and toothpaste. Power converter and power bank. Day pack: This was our one carry-on while traveling, and our one pack with essentials while exploring. Essentials we weren’t sure we’d find there and didn’t want to have to hunt down when we arrived: Coffee, shampoo, conditioner, body wash and a giant bag of snacks. A good book, small journal and pen. Camera gear: Canon 6D camera and wide angle lens (Canon EF 16-35mm f/4L). Vello wireless remote shutter release (and extra batteries). Tripod. (4) 128 GB memory cards. Camera charger and extra camera battery. Laptop: For editing photos, doing research and for the kids to submit homework.